Iceland Pure Unscented Sardine & Anchovy Fish Fish oil supplements offer many well-documented health benefits to people and their pets, and the list keeps growing. Iceland Pure Sardine-Anchovy oil provides a potent, highly digestible source of essential fatty acids (EFAs) and is loaded with the omega-3 fatty acids DHA and EPA, the EFAs most strongly linked to the health benefits of fish oil. Icelandic Salmon Oil came from the pure waters of Iceland. Aminister by mixing with your pet's food. For animal use only. 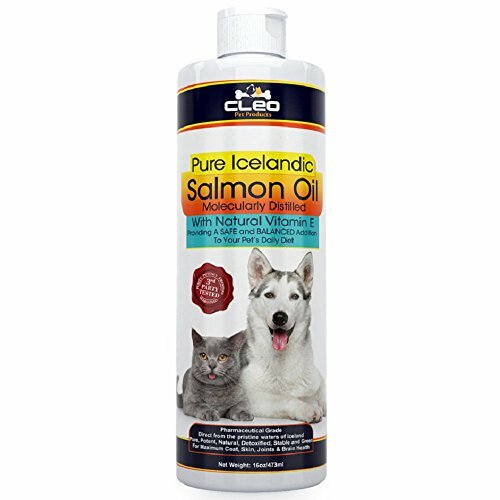 Iceland Pure Salmon Oil is an excellent source of Omega 3 and 6 essential fatty acids. Use as a dialy nutritional supplement to obtain the many benefits of essential fatty acids, including skin and coat health. Includes pump. 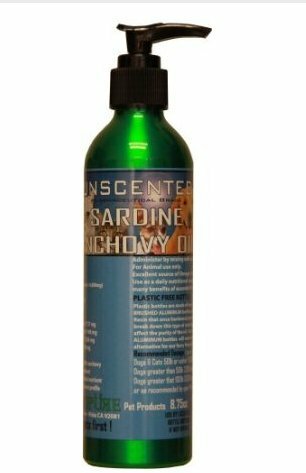 Iceland Pure Unscented Pharmaceutical Grade Sardine Anchovy oil from the clean waters of Iceland. 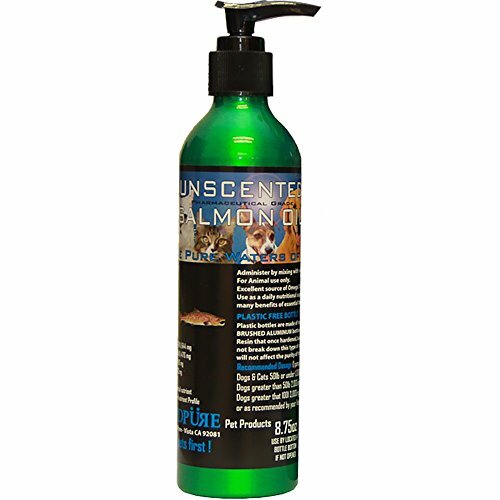 Omega 3 fatty acids per tst 1,296mg.Our oil is practically odor free with great palatability and freshness (preferred oil for cats). Our Sardine Anchovy oil undergoes a molecular distillation process that takes only 45 seconds at 250 degrees C under high vacuum. This shortening of the "sit" or "residence" time for processing greatly improves the quality because it guarantees that no trans fats are created. This natural purification process also removes virtually all toxins and heavy metals to produce a level of purity so high that the oil can be labeled "toxin-free." Samples of our oil are tested regularly for purity by licensed, third-party testing companies, in accordance with strict European safety standards, as stringent or more so than US standards. 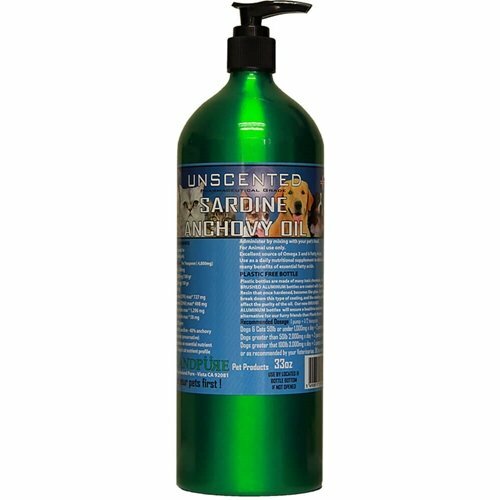 In addition our Sardine Anchovy oil is housed in our exclusive brushed epoxy coated aluminum bottles, the finest quality packaging to help ensure you receive the freshest and safest fish oil available for your pets. These bottles are FDA-approved to hold liquids used for human consumption. 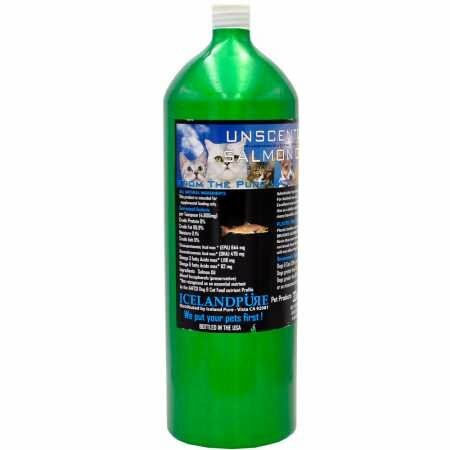 Iceland Pure Unscented Pharmaceutical Grade Salmon oil from the clean waters of Norway. Omega 3 fatty acids per tst 1,118mg.Our oil is practically odor free with great palatability and freshness. Our Salmon oil undergoes a molecular distillation process that takes only 45 seconds at 250 degrees C under high vacuum. This shortening of the "sit" or "residence" time for processing greatly improves the quality because it guarantees that no trans fats are created. This natural purification process also removes virtually all toxins and heavy metals to produce a level of purity so high that the oil can be labeled "toxin-free." Samples of our oil are tested regularly for purity by licensed, third-party testing companies, in accordance with strict European safety standards, as stringent or more so than US standards. In addition our salmon oil is housed in our exclusive brushed epoxy coated aluminum bottles, the finest quality packaging to help ensure you receive the freshest and safest fish oil available for your pets. These bottles are FDA-approved to hold liquids used for human consumption.